These are no ordinary times to discuss Dalit vision* or rather reach a consensus around what could be called Dalit Vision.You have on the one hand the upheaval witnessed in the country especially among educated young dalits and broader democratic sections symbolised by the institutional murder of Rohith Vemula and the mass movement which it has generated and at the other end of the spectrum renowned Dalit leaders paying obeisance before rabid reactionary forces. You have on the one hand slogans of Jai Bhim and Lal Salaam being raised in unison on campuses across the country and on the other the process of mythologising Dr Ambedkar and marginalising ‘his’ meaning being underway nonetheless. Today as we embark on the task of understanding/analysing/debating Dalit Vision we have before us its multiple readings. A new radical reading of it visible in the experiences of the Ambedkar-Periyar Study Circle at IIT Madras or Ambedkar Students Association at HCU or at the other end of the spectrum people who venerate globalisation as the panacea of Dalit’s ills or tell us that with advance of capitalism castes will vanish away are also there to proclaim that they are the true legatee of this vision. In fact a possibility does exist that the emancipatory thrust in this worldview is slowly being marginalised on the altar of pragmatic politics or around our immediate concerns of daily life. As an aside it is important to remember that Dr Ambedkar did have apprehensions about it and had cautioned his followers to this effect. It is one of the most poignant moments of his life that in a public meeting held in Agra in Feb 1956 – where there was a large gathering of newly educated youth from oppressed communities – he literally became emotional (in fact the late Prof Tulsi Ram has written that he literally cried) when he realised that they were not bothered about society or other depressed sections. How does one proceed then to define/debate/discuss Dalit Vision in the present context, which is ‘beyond rhetoric, decorative politicos and Brahminical hegemony’? One way is to ‘collect’ all those ‘visions’ or readings and find some commonality from them. Definitely an impossible task ! What commonality could be derived from a ‘vision’ whose one manifestation supports status quoist politics and the other opposes it. Perhaps the best option available is to not to look at its present day exponents or its various manifestations available but its best exponent ever and see how he envisioned things, how he analysed ‘his’ present or how he forecasted ‘future’, what sort of cautions he shared with his comrades to be taken note of and taking him as our pole star look at ‘our’ present, and define Dalit Vision for our times. This revisiting would also serve another purpose. We have been witness to a new brand of converts supposedly to Ambedkar’s worldview who have started claiming him more aggressively these days surpassing even his loyal followers. Our search would also help demonstrate how the forefathers of these new converts derided him when he was alive and even after his death and how he opposed their politics tooth and nail and cautioned his followers about it. Today when they are competing with each other to lay claim over his legacy let us not forget that one of their ideologues had even penned a few hundred page monograph ‘Worshipping False Gods’ in mid-nineties – which spew venom against Dr Ambedkar (http://www.outlookindia.com/magazine/story/falsifying-the-truth/203929) – an act for which he was suitably rewarded by them when they held reins of power at the centre for the first time, an act for which one is yet to see any apology or self-criticism from them. Everybody would agree that it is challenging task to encapsulate a great wo/man’s vision in a few words- who as a public figure has impacted not only her/his generation but future generations, initiated or channelised debates in the society, led struggles, mobilised people, wrote thousands of pages and left a legacy for all of us to carry forward ? And within a short timespan available before us it is next to impossible to look at Ambedkar’s complete journey or rather quest to usher into – what Prof Gopal Guru writes – ‘enlightened, inclusive India’ from a ‘bahishkrut’ India. To save time one can focus more on the last decade of his life – the most tumultuous period in his as well as the newly independent nation’s life – to know the important concerns which bothered his mind and how he envisioned the future trajectory of the movement he led and how he tried to chart a roadmap for the nascent nation with due support/cooperation and at times resistance from leading stalwarts of his time. It is true that such a focus would obviously rob us of an opportunity to look at the historic MahadSatyagrah – which we in Marathi call as ‘Mahad Kranti’ (1927) an important milestone in his political life, neither we will be able to look at the historic rally he organised against KhotPratha- a feudal practice – alongwith Communists, or his growing disillusionment with Hinduism witnessed after the unsuccessful Satyagrah for temple entry at ‘KalaramMandir, Nashik’ which continued for five years, the way he formed Independent Labour Party or how he told his followers (in his speech to Dalit Rail Workers) that they have to fight the twin enemies of ‘Capitalism’ and ‘Brahminism’ etc and many other milestones of his life. First of all what was his vision for independent India or how he looked at a future roadmap for India. Yes, he has been rightly called the Chief architect of the Constitution and it was his intervention/presence – definitely with due support from Nehru and others – that he could include important pro-people or pro-dispriviledged provisions into it but we cannot be under any illusion that it was only ‘his vision’ which triumphed ultimately. The making of constitution itself was marked by pressures and counterpressures – from believers of radical change to the status quoists – and what came out can at best could be called a compromise document between various contending forces, ideas. Dr Ambedkar’s separation between beginning of political democracy in India with the advent of one man one vote regime and the long hiatus he viewed for ushering into social democracy- regime of one man one value while dedicating constitution to the nation was in fact a reminder of the fact that the struggle is still not over. In the same monograph he clearly differentiates between ‘Untouchables’ and ‘Hindus’. Gone were the days when he felt that Hinduism would reform itself from within and also it had been more than a decade that he had declared at Yeola conference that he ‘may be born a Hindu but he will not die a Hindu’. [h]as developed a new doctrine which may be called the Divine Right of the Majority to rule the minorities according to the wishes of the majority. Any claim for the sharing of power by the minority is called communalism while the monopolizing of the whole power by the majority is called Nationalism. (i) To prevent the majority from forming a Government without giving any opportunity to the minorities to have a say in the matter. (ii) To prevent the majority from having exclusive control over-administration and thereby make the tyranny of the minority by the majority possible. (iii) To prevent the inclusion by the Majority Party in the Executive representatives of the minorities who have no confidence of the minorities. (iv) To provide a stable Executive necessary for good and efficient administration. In fact, his fears vis-a-vis the majoriatarian impulses were evident in the political manifesto of the Scheduled Castes Federation itself— the political outfit which was set up by him in 1942 which rejected the RSS and Hindu Mahasabha as “reactionary” organizations. And anyone who has looked at the making of Indian constitution would tell us why he considered them ‘reactionary’ parties. History is witness to the fact that they opposed its making and suggested in their organs that instead of a new constitution, the newly independent nation should adopt Manusmriti. A laughable suggestion right now but was seriously raised by its proponents. “The worst [thing] about the new Constitution of Bharat, is that there is nothing Bharatiya about it… [T]here is no trace of ancient Bharatiya constitutional laws, institutions, nomenclature and phraseology in it”…“no mention of the unique constitutional developments in ancient Bharat. Manu’s laws were written long before Lycurgus of Sparta or Solon of Persia. To this day his laws as enunciated in the Manusmriti excite the admiration of the world and elicit spontaneous obedience and conformity [among Hindus in India]. But to our constitutional pundits that means nothing”. (Excerpts of Editorial on Constitution, Organiser’ November 30, 1949, whose final draft had just been presented to the Constituent Assembly by Ambedkar. It is now history how the Hindutva Right and the Conservative Sections within the Congress coupled with the Saffron robed Swamis and Sadhus had joined hands to oppose the enactment of Hindu Code Bill. In fact, this motley combination of reactionary, status quoist forces did not limit itself to issuing statements it opposed the bill on the streets and led large scale mobilisation at pan India level against the bill. There were occasions when they even tried to storm Dr Ambedkar’s residence in Delhi. An excerpt from RamchandraGuha’s book gives an idea about the resistance to the bill. In fact, like Mahatma Phule – whom he called the ‘Greatest Shudra’ and included him in the triumvirate of Buddha, Kabir whom he considered to be his teachers – the concern for women’s emancipation always existed in movement led by Ambedkar. I will accept and follow the teachings of Buddha. I will keep my people away from the different opinions of Hinyan and Mahayan, two religious orders. Our BouddhaDhamma is a new BouddhaDhamma, Navayan. An important development in the last decade of his life was his decision to embrace Buddhism with lakhs of followers. Apart from his deep fascination for Buddhism from younger days, his conversion to Buddhism had also to do with his contention that the ‘untouchables’ were in fact former Buddhists. He elaborates it in his book ‘The Untouchables: A Thesis on the Origin of Untouchability(1948). 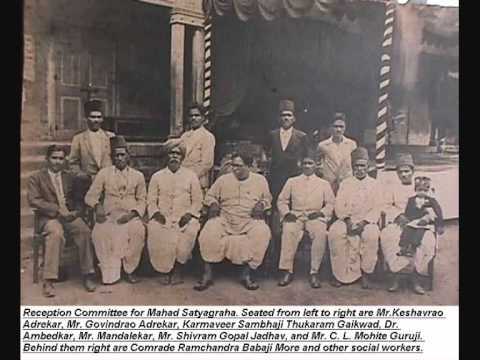 ( For details : https://kafila.org/2016/04/26/jayadeva-uyangoda-on-ambedkars-legacy/) Thus it could be also said to be return to ‘their’ original religion than a conversion. Interestingly one finds deep commonality between Dr Ambedkar and JyotheeThass, the great Tamil-Buddhist Scholar, who also maintained that ‘Untouchables’ were early Buddhists. If one refers to the 22 pledges he administered to the followers on the occasion then one can broadly categorise them into four -complete rejection of Hindu gods (e.g. I will not accept Brahma,Vishnu and Mahesh as God and will not worship them) and their worship and the related rituals (I will not perform shraddhaPaksh or Pind Dana(Rituals to respect the dead), acceptance of the principles and teachings of Buddhism, declaration that ‘all human beings are equal’ and ‘no faith in divine incarnation’. Ambedkar differentiates himself from popular definitions of religion first by criticising the way religion(s) have tried to explain origin and end of world around and says that its ‘function is to to reconstruct the world and to make it happy’. And he further explores source of unhappiness and does not talk about ‘sins’ or ‘otherworldly affairs’ but says that ‘unhappiness in the world is due to conflict of interest and the only way to solve it is to follow the AshtangaMarga’ Further elaborating on ‘Creed of Buddhism’ he says that ‘private ownership of property brings power to one class and sorrow to another’ and ‘it is necessary for the good of Society that this sorrow be removed by removing its cause’ While religions the world over have remained the basis of ‘othering’ – which in extreme cases have resulted in big genocides also – Buddhism as perceived by Ambedkar ‘ All human beings are equal’ ‘Worth and not birth is the measure of man’. This speech – as the title shows – also throws light on his views about Marxism. Of course it is not for the first time that he had expressed his views on the theme. In his famous booklet ‘Annihilation of Caste’ he had already made it clear that while he appreciates goal of Marxism but is repelled by its Indian Practioners. The Russians are proud of their Communism. But they forget that the wonder of all wonders is that the Buddha established Communism so far as the Sangh was concerned without dictatorship. It may be that it was a communism on a very small scale but it was communism without dictatorship a miracle which Lenin failed to do. ‘The Buddha’s method was different. His method was to change the mind of man: to alter his disposition: so that whatever man does, he does it voluntarily without the use of force or compulsion. We welcome the Russian Revolution because it aims to produce equality. But it cannot be too much emphasised that in producing equality society cannot afford to sacrifice fraternity or liberty. Equality will be of no value without fraternity or liberty. It seems that the three can coexist only if one follows the way of the Buddha. Communism can give one but not all. It is an India where the political dispensation at the centre is busy furthering the exclusivist/majoritarian worldview of HindutvaSupremacism coupled with the neoliberal agenda under the glib talk of development and concerted attack has been unleashed on (what Ambedkar defined as ) minorities of various kinds and other deprived sections. What can be said to be the contours of Dalit Vision for our times then. It will have to be necessarily for ensuring that’state shall not recognise any religion as state religion’ and ‘guarantee to every citizen liberty of conscience’, it has to be against ‘majoritarianism of every kind’ and specifically -to prevent majority from forming a Government without giving any opportunity to the minorities to have a say in the matter.- for women’s emancipation,, for State ownership in agriculture with a collectivised method of cultivation and a modified form of State Socialism in the field of industry, against inequalities of wealth which private capitalism produces, it will have to be necessarily for annihilation of caste as ‘The existence of the Caste System is a standing denial of the existence of ideals of society and therefore of democracy.’(Speech on the ‘Voice of America’ radio (20 th May 1956) It will be for reason and rationality and scientific temper and not for dumbing down of minds. Capital is the surest means to fight caste. In dalit’s hands, capital becomes an anti-caste weapon; little wonder that the traditional caste code prohibits dalits from accumulating wealth. Dalit capitalism is the answer to that regime of discrimination. The manifesto demands promotion of dalit capitalism through a variety of means-procurement, credit options and partnerships. An important point is Dalit Vision will have to be wary of ‘Hero worship’ or laying ‘liberties at the feet of a great man’ as it can culminate in ‘subverting of institutions’ in a Democracy as Ambedkar has warned us. In fact he had this to say while dedicating Constitution to the nation. Timely presentation on an important occasion …. The last years of Ambedkar saw signs of rise of hinduism and also start of erosionof constitutional values. He expressed his dissatisfaction in his last years during interactions and speeches. His fears are relevant to – day as hindutva forces are not only ruling but also violating constitution with impunity. On top of it, ironically, they are appropriating Ambedkar to their ideology in such a way that one cannot differenciate the truth unless carefully observed and discrepency brought out.